India is the land of festivals, we Indians celebrate every occasion with lots of happiness and love. Baisakhi is one such festival which is celebrated with great zest and zeal. It is observed mainly in Punjab and its neighboring parts. Every year families and friends get united to celebrate this auspicious occasion and this year Baisakhi falls on the 14th of April . It marks the beginning of new year for Sikhs and Punjabis. Being an agrarian state Punjab is known for the harvesting of crops especially, rabi. Harvesting is the biggest source of income for the majority of people, therefore, in Baisakhi farmers rejoice and welcome another harvesting year by praying to God for a fertile season. Also, Baisakhi is one of the biggest religious days for Sikhs as on this day their 10th guru, Guru Gobind Singh, established Khalsa Panth in the year 1699. It is also believed that on this auspicious day, Guru Gobind Singh converted his five disciples into Singhs for the first time by giving nectar to them and by admitting them into the martial community. On this very day, the religion of Sikhism was born and Guru Granth Sahib was established as a religious guide for the community. 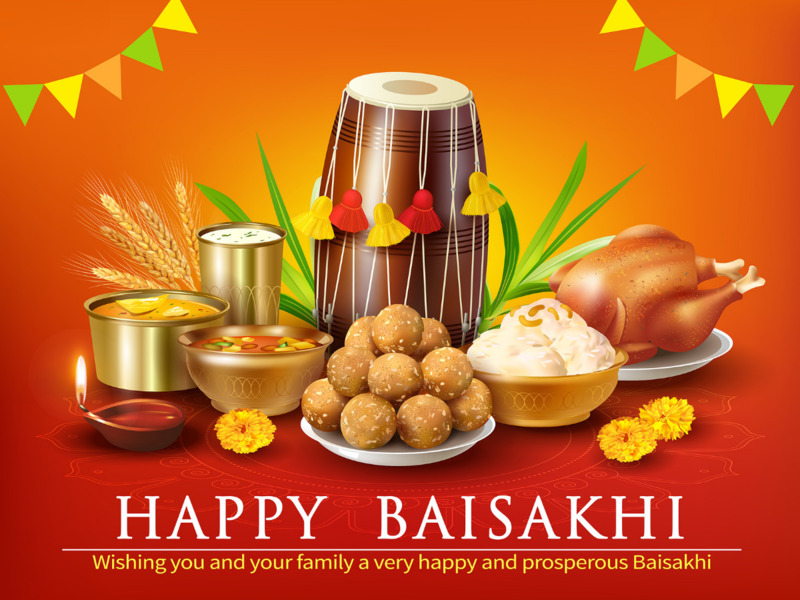 Therefore, Baisakhi is celebrated as a festival where people dress up in vibrant coloured traditional outfits and perform bhangra, do kirtan and rejoices to the beats of nagada. Like any other festival, Baishaki is also incomplete without cooking and eating traditional Punjabi food. Punjabis are famous for being super energized and the secret for their incredibly high energy can be blamed on their scrumptious delicacies. Their cuisine offers such a tempting variety of mouth-watering traditional food that you won’t be able to resist once you get to taste these distinct flavours. One of the classic and most loved combinations of all time is Makki ki Roti and Sarso ka Saag. The corn flour flatbread served with spicy mustard leaves makes for a tasty amalgamation of veggies and spices cooked to perfection. This delicious dish should be on your menu if you are planning to prepare traditional foods for Baiskhaki. The festivities are incomplete without a sweet and what’s better than the very famous Gud ka Halwa. It is an easy and comparatively a healthy sweet dish which you can prepare in no time. Relish this dessert with your family and friends after your Baishaki lunch or dinner party. It is made using jaggery, suji and desi ghee. This dish needs no introduction, it is one of the most famous foods in North India. It is loved and enjoyed by everyone and especially during Baisakhi, Chole Bhature is prepared in every household. You need very few ingredients to prepare this mouth-watering dish which can be served in breakfasts, snacks or even can make for a complete meal. Kadhi Chawal is the most comforting food for the people living across North Indian states. It is prepared using a tasty amalgamation of creamy curd and besan. The Punjabi Kadhi is also made using some easily available vegetables, curd, very little spice, and besan. On the day of Baisakhi, some people like to prepare this traditional delicacy to relive the memories of their childhood. It is severed with steaming hot rice, pickle, and pappad. Pindi Chana is made using chana dal or chickpeas and some Indian spices. It is very easy to prepare the recipe and saves a lot of your time and energy. This delicious dish is very nutritious and can be clubbed with roti or even chawal. It also makes for a great side dish, you can severe it in your Baisakhi dinner or lunch party to impress your guests. No one can prepare lassi like how Punjabis do. They literally make the most delicious lassi you will ever find. And they do crave for lassi like no one else does, therefore any Punjabi festivity is incomplete without a glass full of their traditional lassi. If you are hosting Baisakhi party this season, then don’t forget to serve this lip-smacking dry fruit lassi to your guests. Phirni is a creamy concoction of rice, koya, and nuts that is served during the festival Baisakhi. It is a traditional sweet dish, which is a must try for every foodie. This aromatic dessert has a very rich and creamy texture. You can serve this delicious dessert after dinner to your friends and family on the auspicious occasion of Baisakhi.